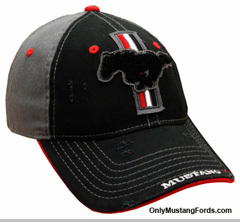 Looking for Ford Mustang hats ? As you've probably noticed, nice quality ones are hard to find, so I've provided some links below for caps you'll be proud to wear. These hats make great birthday and Christmas presents for the pony car fanatic in your household and are just what you need to be comfortable when cruising with the top down! Check out the Mustang Apparel page too, where you can find some other choices for wearable licensed pony car wear and more caps and hats. Click on the blue links for complete information. Whether you prefer the original 1969 and 1970 Boss 302 cars or the new Coyote powered 5.0 Boss, these beauties could be the right hats for you! Crafted in super quality made brushed cotton, these Ford Mustang Boss 302 Hats look just right. They're vented of course, fully adjustable, with a strong velcro enclosure and extremely comfortable. If you don't like your new jeans until they have a bit of wear, then you probably wished your new ball cap was the same way. Here's the solution. This retro Ford Mustang" Vintage Hat , with just the right amount of fade and "distress" to make it look great right out of the box. 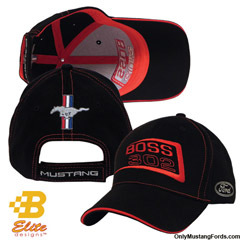 Still looking for a Ford Mustang Cap or other wearable goodies for your favorite pony car enthusiast (or maybe you) ? Use the search box to find more information.